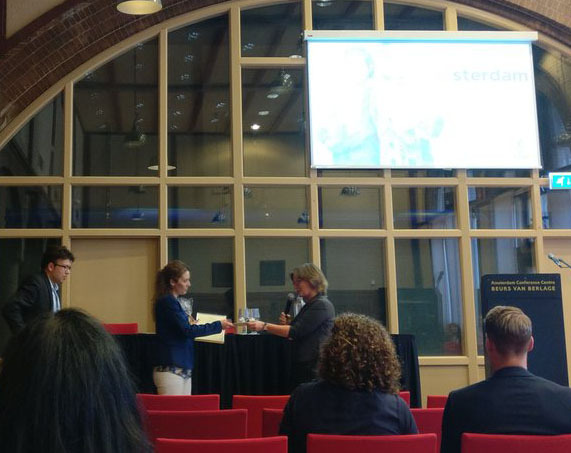 Verónica Gómez-Gil, collaborator in Unit 17 of NANBIOSIS and the GITBIT-UAH group (CIBER-BBN), has been the first prizewinner in the Best Abstract Competition at the symposium “New horizons in prevention and treatment of adhesions” organized by the Dutch Adhesion Group (DAG) at the 52nd meeting of the European Society for Surgical Reseach (ESSR). The ESSR 2017 meeting was held in Amsterdam from 14th till 17th June. The title of the abstract, presented as a quick-shot presentation and a full oral during the congress, was: An experimental adhesiogenic model to evaluate histological events over time in the omentum during adhesion formation. This work shows that distribution of soluble and membrane-bound form of betaglycan, together with the expression of TGF-β1 and TGF-β3 at each time point after adhesion formation, are key factors to the cytoarchitecture and composition of omental adhesion tissue. These findings are of interest in the design of new adhesion prevention strategies. CIBER-BBN along with other leading partners from various European countries, are setting up the “Precision Nanomedicine for People (Nano4P)” Flagship Initiative (www.Nano4P.eu). Nano4P aims to develop material science and nanotechnology-based highly precise tools for the detection and tailored treatments of diseases, based on the unique characteristics of each person and taking advantage of stratification and molecular-level information. In this way, the paradigm shift that is already becoming visible in the healthcare system, will definitively enable to move from traditional treatment of diseases by existing drugs/tools, towards a predictive, preventive, precise and participatory (4P) medicine. FET-Flagship Initiatives tackle grand science and technology (S&T) challenges. To get the expected outcome and an added value to Europe, the close collaboration of a large number of different scientific disciplines, industries, public regulatory agencies and nanosafety agents is mandatory. To date, only two initiatives of this FET-Flagship program have been developed, one of them, the Graphene project, with the participation of some CIBER-BBN groups and NANBIOSIS Unit 8. We cordially invite you to support the FET-Flagship Initiative Nano4P by fulfilling the online template in the SUPPORT NANO4P section (http://www.nano4p.eu/support.php) of NANO4P website (http://www.nano4p.eu/). The interplay of all of us will definitively strength the Nano4P Initiative to build a network of excellence leading from the invention and development of disruptive technologies to the needs of the European society. NANBIOSIS has actively participated in the third bi-annual conference organised by EATRIS, (the European infrastructure for translational medicine) in Prague on 24-26 of September Translational Medicine 2017: Enhancing predictivity in medicines development . The event gathered a wide range of stakeholders (industry, academia, policymakers) and focussed on bringing together the latest approaches to increase chances of success in drug development, from novel in vitro systems to new biomarkers or clinical trial methodology for patient selection and stratification. 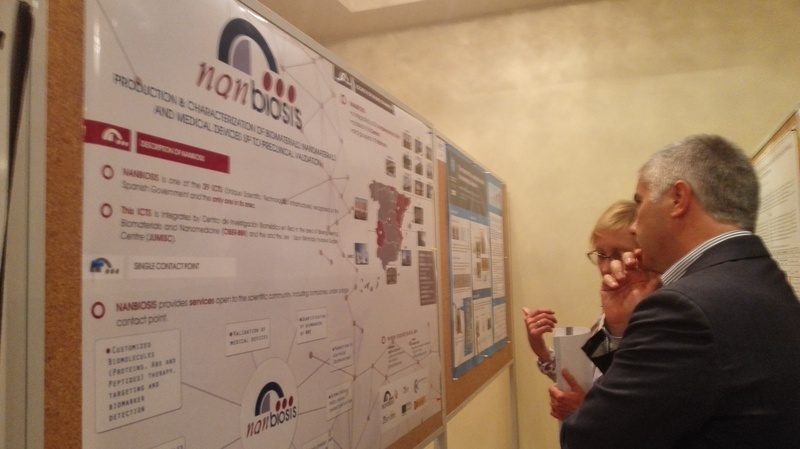 Jesús Izco, Coordinator of NANBIOSIS, presented NANBIOSIS initiatives of joint collaboration, which were well received and will be coordinated and developed during the next months. NANBIOSIS organizes a forum for researchers and companies. Dates (probably February 2018) and location (probably Madrid) will be announced soon. The theme of the Forum is INTELLIGENT BIOMATERIALS / FUNCTIONALIZATION AND BIOMEDICAL DEVICES FOR APPLICATIONS IN REGENERATIVE MEDICINE AND DRUG DELIVERY. • First session: Short interventions of the latest advances and developments in the lines of research developed by the groups and platforms of Nanbiosis and description of the needs and demands of industry in that area. The companies and groups that request it will be able to have about 10 ‘to present their lines of research and / or needs and demands in relation to the thematic of the forum. • Second session: Bilateral company-group / platform meetings to identify possible collaborations. These meetings will be pre-scheduled on request. If you are interested in participating, contact Eduard Farré (628.943.198, efarre@arvor-ing.com) or with Jesús Izco (679.490.537, jmizco@ciber-bbn.es). A new extraordinary deadline for admissions to the II MASTER ON ENDOSCOPY AND MINIMALLY INVASIVE SURGERY IN SMALL ANIMALS has been set up, from 1st to 14th September. 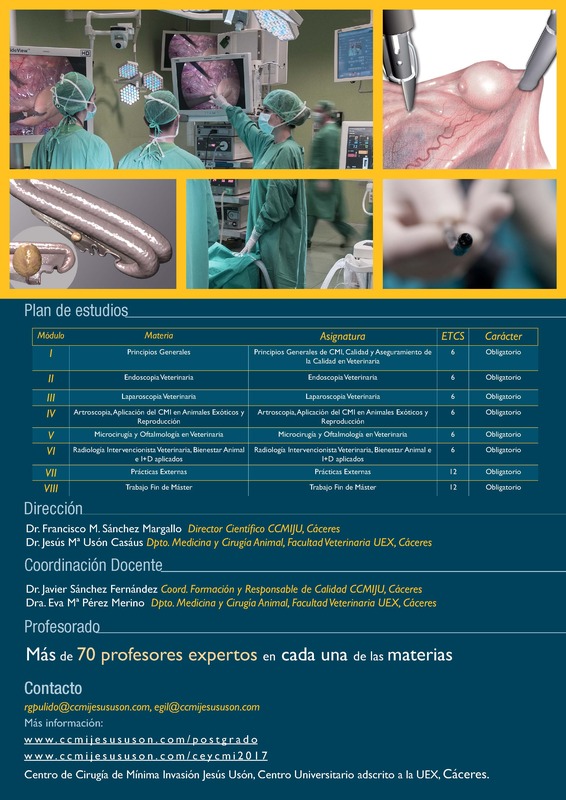 It is organised in collaboration with the Extremadura University ant takes place in Jesús Usón Minimally Invasive Surgery Centre as affiliated entity, offering 60 ECTS-credits.Necessary requirements include having a Veterinary studies degree and a B1 English Certificate. The Master will be held during the academic calendar 2017-2018, according to the established program, that will promote the interaction with the students via an on-line training platform, the direct contact with professors and experts, as well as offering an open material repository. The Master consists on 4 hands-on training sessions at the JUMISC’s, an external stage in one of our partners centre and the Master’s degree final project. Jesus Santamaría, Scientific Director of Unit 9 of NANBIOSIS has participated in a study that shows the ability of gold nanoparticles to generate in situ potent anticancer drugs from inert molecules thanks to a mechanism of elimination of terminal chemical groups that nanometric gold is able to catalyze. Gold is ideal for this catalytic role due to its high biocompatibility. These results, published in the journal Angewandte Chemie, offer new hope in the fight against cancer and have been obtained thanks to the collaboration of scientists of Unit 9 of NANBIOSIS and, Víctor Sebastián, Silvia Irusta and Jesús Santamaría, with researchers from the Center for Cancer Research at the University of Edinburgh, led by Dr. Unciti-Broceta. The work reveals the possibility of carrying out catalysis in biological means using tiny particles of gold. These gold nanoparticles, camouflaged in a resin microcapsule implanted in the brain of a zebrafish, have succeeded in catalyzing a chemical reaction generating fluorescent compounds. “The main problem of chemotherapy treatments are the side effects in various organs due to the toxicity of the molecules that are used to fight cancer. For this reason, alternative routes are explored from nanotechnology, for example, transporting drugs to the tumor using nanoparticles or alternative treatments to drugs, such as hyperthermia, elevation of local temperature, obtained with nanoparticles”, says Jesús Santamaría. The conclusions of this work suggest a different way: the drug would be supplied to the patient in its inert form and only converted to the toxic form locally, thanks to the catalysis of the nanoparticles that a surgeon would implant in the tumor.